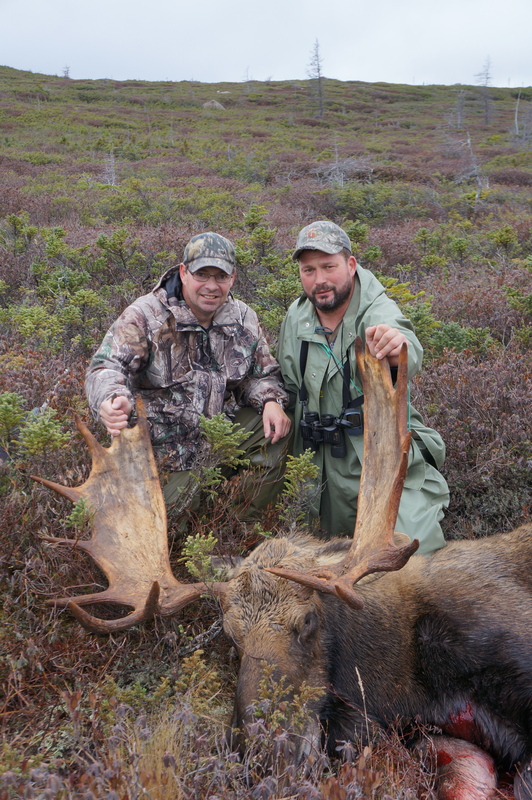 If you are you looking to plan your next Caribou or Moose hunting adventure choose Newfoundland, Canada, and choose Sou’wester Outfitting,call 1-877-751-1681. Sou’wester Outfitting offers one of the best Newfoundland Hunting experiences backed by experienced guides. Sou’wester Outfitting offers world class, fly-in, fair chase, no nonsense guided hunts from remote full service facilities situated in Newfoundland’s pristine interior. Catering to rifle, bow and black-powder hunters since the early 1990’s, trophy animals are taken on a weekly basis. Whether hunting Woodland Caribou, Eastern Canadian Moose or Black Bear all hunts are spot and stalk in nature. The spot and stalk method of hunting requires the hunter to hike the countryside while keeping a lookout for the quarry of one’s choice. Sou’wester Outfitting operates three Newfoundland hunting camps in its Caribou Valley operation where moose and black bear densities are second to none and caribou run supreme. The terrain in the immediate vicinity of Caribou Lake, Indian Pond and Little Lake, where the hunting lodges are located, offers habitat and phenomenal hunting for all three animals. All hunts, which are one on one guided, take place in either an Ecological Reserve or a Wildlife Reserve where there are no other outfitters and the only hunters that you will encounter are those at camp. Sou’wester Outfitting’s big game hunters are permitted to hunt for ptarmigan and grouse for no additional fee other than the cost of the license. While Willow Ptarmigan are more numerous than Rock Ptarmigan, both are found in the vicinity of both lodges. Ptarmigan are known throughout Newfoundland as partridge. In addition to the two types of ptarmigan, both areas also have Spruce and Ruffled Grouse, with the Spruce Grouse being the most common. Whether hunting for moose, caribou, or black bear, Sou’wester Outfitting provides some of the best fly-in full service hunts in Newfoundland and Canada. Rifle, bow and black powder hunters are all welcome. This is a family owned and operated since the early 1990’s, Sou’wester Outfitting continues to offer world class hunts that provide big game memories to last a lifetime. Book Your Dream Hunt Today! Newfoundland’s ultimate big game challenge. There is no time for idle play on this hunt. Moose, caribou and bear in one week. The first challenge is to get three animals, the second to get three trophies. Sou’wester Outfitting provides some of the best big game hunting available in Newfoundland and Canada. All Sou’wester moose hunts are one-on-one guided and fly-in-only. Take a spot and stalk Black Bear in combination with moose and caribou hunting packages. Woodland Caribou hunting that is truly world class and second to none in quality. Owner/Operator served several terms as President and Vice-President of the Newfoundland and Labrador Outfitters Association.